The new blog is still a work in progress but at least I'm on the air! 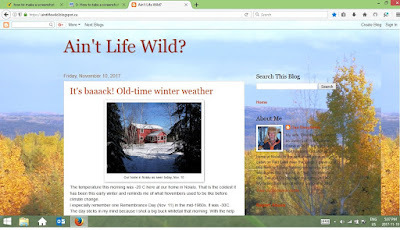 I'm starting a new blog -- Ain't Life Wild? --to better reflect my life since retiring from Bow Narrows Camp. The old blog will still be there for everyone to review but it will not have any new postings. First started in 2007, it contains tons of how-to articles and other stories about life at camp and in Northwestern Ontario. But mostly, it was about fishing since Bow Narrows was first and foremost a fishing camp. Ain't Life Wild? will be about all the other things that make living in Northwestern Ontario the best place in the world. I love this place and its plants and animals and hope to chronicle this life in the new blog. Take a peek and please leave a comment! Ain't Life Wild? We had our first frost here in Nolalu today, Oct. 14. That's about six weeks later than it should have been. We were up at camp last week helping the Spillars and saw Red Lake's first frost Oct. 10. My trail cameras here are starting to pick up whitetail bucks on the move. Pretty much all summer there have been nothing but does and fawns. Researcher Kelsey Jones-Casey gave a summary of her study on climate change at Lakehead University last week and asked a few of her interview subjects to speak out. I was one of them. I mentioned how there were no ticks in the Nolalu area when we raised our children here 30 years ago and now the place is tick heaven. We believe the ticks came with the deer which did exist here back then but were an oddity. This was moose country. Now you can go a full year without finding a moose track in this township. The main thing going on is the deer carry a parasite that is fatal to moose. The deer have flourished because of our milder winters, especially the lack of snow. As I've mentioned here before, the deer heavily browse many tree species to the point there is no regeneration taking place for white cedar or any of the pines: white pine, jackpine and red pine. Lots and lots of deer mean lots and lots of wolves. They are the second-most photographed animals on my trail cameras after deer. I mentioned two events that I've seen at Red Lake. 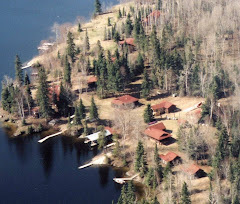 During our 26 years of running the camp we had one stretch of about six years where only about 10 per cent of the loons successfully raised chicks. The problem was the lake level kept rising after the loons had made their nests. Almost all of the nests flooded and the eggs were lost. There is a water control dam on Red Lake operated by the Ontario Ministry of Natural Resources and Forestry so I asked them if they would open it until the loon nesting season was over in late June. They eventually did so but it made no difference anyway -- the lake kept rising throughout the summer. This went on for years. Although many of those summers did not seem to have more rainy days than normal, what was going on was increased precipitation any time it did rain. Instead of it raining one-half inch in a storm, it rained two inches. The natural cycle for the lake level should go something like this: when all the snow from the winter melts in the spring, the lake should be at its highest. This is when the loons make their nests, one body's length away from the water since they cannot walk on land. Then as the summer progresses the water level continually falls. Not only is there less water draining into the lake from creeks and rivers but also a great deal of evaporation takes place. These days there is very little snow to melt and the biggest precipitation events happen in the summer. Fortunately, loons are a long-lived bird, likely reaching 20-30 years. They were able to go six years in a row without nesting success with no observable drop in population. Eventually there were some drier years and they successfully fledged young again. Although nothing drastic happened it did show how climate change can affect loons. I said at the session that had we lost the loons I would have been seriously bummed. Loons have been my neighbours all my life. I know what their calls and body language mean. If I could have a totem creature it would be them. The call of the loon is the call of the wild. It is the sound of Canada. The other event I mentioned was the near-collapse of the lake trout. Although now on the rebound we came close to losing these incredible fish. They were over-fished in the 1980s and '90s but their spawning success also took a nosedive. The most likely reason is the warmer water temperatures in the fall. The lake can be no warmer than 12 C during the first week of October or the fish won't spawn.The warmer temperatures might also have made naturally-occurring elements in the rocks on spawning shoals harmful to lake trout eggs. Of course, I could have just talked about how much warmer it is. Thirty years ago we would be getting the first snow flurries right now. By comparison, today I saw three bluebirds in the yard. The crickets are chirping and there are butterflies flitting about. It is 16 C or 61 F. A week ago it was 31 C or 88 F. Our first frosts used to come in late-August. We haven't even had the first frost this year. By the looks of the forecast it might not happen until late October. This is supposed to be the time when the moose go into the rut, racking their antlers against trees with steam billowing from their noses. Now they would probably prefer to be soaking in the lake. When I was a kid growing up in Red Lake in the 1960s we wore our snowsuits under our Halloween costumes. It was the same for Brenda in Eastern Ontario and for our kids in the '80s in Nolalu. Invariably that would also be the night of the first snow that stuck all winter. These days it might not snow until mid-December. We are getting very close to having brown Christmases. Kelsey's study was not about things like changing precipitation and temperature but how people in Northwestern Ontario feel about them. Most of her study subjects are worried. I said I was sad, not about the changes taking place so much but how our societies are not doing enough to stop the carbon pollution that is driving the changes. It's not rocket science. We've known what to do for at least two decades. Get off carbon fuels. Certainly, I said, we wouldn't be building new pipelines and stepping up extraction of the oil sands. Actually, that is exactly what we are doing. There are some successes though. Ontario has closed all of its coal-burning power plants. I'm glad I live in Ontario. But most of the changes taking place are coming from individuals, not states or provinces. Brenda and I have personally done some things. For instance, our home here in Nolalu is so insulated and air-tight that our six-month winter heating bill is the same as a single month in lesser-insulated homes. We also oriented the house so that the long side faces south and put almost all the windows on that side to catch the winter sun. The north side only has three small windows and the main entry doors. Those doors open not into the main house space but rather small rooms that have doors closed to the rest of the building. These airlocks prevent us losing all the warm air in the house when we open the outside doors. We didn't do all this because we were radicals or left-winged or anything else. We did it because it would save us money and boy, did it ever! Now that we have retired we have built a sunroom on the south side of the building. This has three walls with almost all windows and our hope is in the winter it will heat itself just from the solar gain. We have a way of circulating that warm air throughout the house.There is a door between the sunroom and the rest of the house which we can close at night. We also did a few things at camp that used less fuel (and saved us lots of money). For instance, we switched to four-stroke engines for both the fishing boats and the big supply boat. They used one-half the fuel of the older two-strokes. The engines literally paid for themselves. That is the message the fossil fuel industry doesn't want you to hear: every time you find a way to use less fuel you save money. I like to put it the opposite way, "Keep using lots of fuel and you'll make the obscenely rich oil oligarchs even richer." When we build our cabin on Red Lake next year it will be solar-powered. No more diesel generator! The advances made in recent years for such things as solar water pumps and refrigerators are incredible. Ditto for solar lights. We have picked up a couple of solar-powered table lamps for the cabin. Set them outside in the days and they will provide light for up to eight hours. The only sane choice now is to live sustainably. Anthropologists tell us that if you could bring a Stone Age man to life he would have no trouble fitting into today's civilization. He could use a computer, drive a car, fly a plane -- anything that modern humans do. That's because he was just as intelligent as you and me. Not much happens from an evolutionary point of view in just five thousand years. I would expect most people would accept that premise. What they might have trouble realizing, however, is the reverse is true too -- today's man is no different than his Stone Age predecessor. Man back then was hard-wired to fear things and for good reason. Imagine your many, many-great grandfather as he sat knapping some spearpoints on the steppes or prairies or the plains of the Serengeti. He sees a brownish-tan object. If he reasons it might be a lion or a saber-toothed cat or giant bear and moves to higher ground, he lives and passes on his genes which includes the ones to fear anything you don't know. If he thinks, "Oh, it's probably just a rock," he eventually becomes dinner and his line disappears. This explains why people seem so quick to fear things. We fear strangers, things that go bump in the night and anything that is unfamiliar. Fear first and ask questions later is our motto. Over time our reasoning ability overcomes some of our fears but we're always ready to revert to survival mode at a moment's notice. From an outdoors perspective this could explain why so many people are afraid of snakes, spiders, creepy insects (literally, insects that creep) the dark and most animals. It also explains why it is human nature to horde food -- we're afraid of starvation even though in reality we have so much food that we're dying from obesity. Freezers full of fish and game are a good example. I always cringe when I hear stories of how the power went out and somebody lost the natural bounty in his freezer and has to start all over. What a waste, both for losing the freezer-burnt food but also for feeling the necessity of accumulating it in the first place. There are too many people in the world now for us to stockpile wild food and then throw it out when we discover we don't need it or that it has gone bad. When it comes to wild fish, my family has adopted the practice of just keeping what we need for a single meal. Most frozen fish, including northern pike and walleye, go downhill very rapidly as far as taste is concerned. They are wonderful when fresh but once frozen I can tell the difference in just one week. I find them extremely "fishy" tasting after a month, certainly no better and maybe not as good as frozen fish I can buy at the supermarket. I would rather have the thrill of catching and releasing fish and only eating a few of them fresh than the false smugness that comes from stockpiling them in the freezer. I use my vanity genes to overcome my fearful ones. I'm such a good fisherman, I tell myself, that I can always catch fish any time I want them. It's worked so far. One of the most numerous and conspicuous plants in the bush around here is the Thimbleberry or Rubus parviflorus. It produces enormous maple-shaped leaves, pretty white flowers in the spring and now, in late-summer, tasty red berries. There are only a few of the raspberry-sized berries on each plant but they are extremely easy to pick since they are two-to-three feet off the ground. Just as noticeable as the thimbleberries, however, are the abnormal growths on the plant stems. These bulbous galls often resemble a fruit themselves but in fact they are the result of parasitic wasps. Diastrophus kincaidii wasps lay their eggs in the stems and when the larvae hatch they feed on the starchy tissue. The plant reacts by building the stem around the grubs thus forming the gall. Just about every thimbleberry plant here in Nolalu has at least one gall and some have several. I haven't seen it but there is yet another parasitic wasp that lays its eggs inside the larvae of the first wasp. The wonders of the bug world! It might not be obvious but this blog posting goes part and parcel with the last two. Those others dealt with lake trout coming back in Red Lake and an abundance of deer in Nolalu and other places in Northwestern Ontario. What is the connection? Climate change. Lake trout may have quit spawning successfully in Red Lake for nearly two decades because the water was simply too warm in the fall. During the 17 years of lake trout study and stocking by the MNRF and assisted by Brenda and I and our staff at Bow Narrows Camp two facts came to light, both involving temperature. Several times during that period the lake temperature was above the 12 C maximum needed for spawning. The result was most of the female trout never came to the spawning beds. If the temperature isn't 12 C or colder in the first two weeks of October, spawning success will be near-zero. The lake temperature must align with the photoperiod. The other fact was the discovery of manganese in the sediment of the spawning shoals. Where did it come from? The rock itself. There is naturally occurring manganese in the bedrock of the spawning shoals. Yet, lake trout have been spawning there successfully for probably 10,000 years. Why would it be a problem now? Manganese is inert at low temperatures and becomes reactive at higher ones. A very real possibility is that the warmer fall temperatures are making the manganese kill the trout eggs which are one of the most sensitive things in nature. We don't have the warm temperatures every fall but these warm years are becoming more and more frequent. For a lake trout population that was already stressed to the limit by overharvesting, it could have pushed them over the brink. Fortunately, the MNRF's stocking program has saved the day and trout are once again spawning in other places besides Pipestone Bay. The deer example is more obvious. Warm winters and a lack of deep snowfall, all part of climate change, has seen a population explosion for this species. Because of their numbers they are eradicating moose and changing the vegetation on the landscape. So now the flashlight. It's a dandy. I wrote about getting it a couple of years ago. I have used it every night since and haven't bought a single battery or plugged it in to charge even once. I just set it in the window and the sun does it for free. It lasts something like 22 hours on a single day's charge. And it is incredibly bright. If you are thinking a solar flashlight isn't going to hold a candle to today's super-flashlights, you haven't been paying attention. Solar energy has taken a quantum leap in recent years. And the cost of solar equipment has plunged as the entire world jumps on the bandwagon and mass production lowers the cost of everything. There are still tons of things to invent and manufacture, all using solar. Here's one that came to my attention lately. A person with a canoe that he powers with a 12-volt electric trolling motor and battery told me he tried plugging the motor directly into two solar panels that he carried amidships. With absolutely no battery connected his motor powered up to about 60 per cent of top speed. Now just imagine if the entire canoe -- or boat -- was made out of photovoltaic cells. The world is converting from the internal combustion engine to electric energy at warp speed. And the proportion of that energy created by solar and wind is increasing exponentially. Who is the largest automaker in the U.S.? GM? Toyota? Honda? Actually, it is Tesla, the maker of affordable electric cars. The reality of never spending a nickel at a gas station again is closer than most of us realize. In fact, we could all make it a reality right now. Our cars can be charged from solar panels on the roof of our houses and on the parking garages at work. Or from the utility. That takes care of commuting and just about all of our normal daily driving. For long trips we need to build a network of recharging stations. It's already happening in California and the only thing stopping it everywhere else is a lack of political and business leadership. Let's get at it. Not doing it is like clinging to the horse-and-buggy a hundred years ago. And the money we save will be our own as will the planet. Anglers are catching little lake trout in Red Lake and that is spectacular news! That statement might seem confusing to people who are not familiar with the lake trout situation in Red Lake. After all, don't you want to always catch big lake trout? No. No you don't. During the 1980s and '90s Red Lake gained the reputation of having some of the largest lake trout anywhere. They were plentiful and easy to catch and as a result there was a colossal over-harvest. The curious thing was no one caught little lakers. Around the year 2000 studies showed there just weren't any. It was also found that the few remaining mature trout, almost all located in Pipestone Bay, were not successfully reproducing although they were found to be perfectly healthy. This began a 17-year long program by the Ontario Ministry of Natural Resources and Forestry to renew the trout population and bring back the fishery. Hundreds of volunteers as well as camps and businesses have joined in. About a million fingerlings reared from Red Lake's own wild trout have been released in the lake. The planted fish can be identified by a missing fin. The MNRF clips a different fin each year. Meanwhile naturally-spawned fish are showing up in anglers' catches as well. Bow Narrows angler Jerime Williams holds one in the photo up top. It has all its fins. All lake trout must be released on Red Lake while this species rebuilds. Regulations also require anglers to only use lures with single barbless hooks and not to use any bait, alive or dead. I have begun to fence-off areas from deer to give some trees a chance to grow beyond the deer's reach and appetites. The photo above is my first attempt. I have used commercial seven-foot deer fencing to enclose a group of red maples that have sprouted up this summer. In the foreground is a maple that is already too large for the deer to kill by browsing. My hope is that by blocking-off relatively small areas the deer will choose just to go around and look for easier pickings. I'm going to try something similar in other spots to allow young white cedar and white pine to take root. Right now the deer are eradicating all these species simply by eating all of the young saplings. There is a browse line though our bush showing the height deer can reach during their mostly-winter foraging. There are mature trees but no young ones. While deer hunting in the Nolalu area many years ago I made an amazing discovery. I was sitting on a stump waiting for a deer to come walking along when I casually peered into the hollow stump next to me. It was absolutely filled with hazelnuts! It was the first time I had ever seen a nut in Northwestern Ontario. Where did they come from? Obviously, this was a squirrel cache but where were the nut trees, I wondered? I looked all around the spot and could only see the usual Boreal Forest trees such as birch, poplar and spruce. But there were a lot of shrubs in the area. These had already lost their leaves for the season. Eventually the idea that the nuts must have come from the shrubs permeated my thick skull. I didn't have the nature reference books in those days that I do now but somewhere I finally found that Beaked Hazel is a common shrub in the Boreal Forest. The next fall I had my eye out for hazel bushes with their little striped trunks so I could gather some hazelnuts for myself. I found the bushes around all the clearings and fields on our property but there wasn't a single nut anywhere. Then I noticed they also grew right along the lakeshore at camp in Red Lake and finally saw the nuts in the making in the spring. By mid-summer, however, they were gone. I never saw what took them but I knew from the hollow stump experience that red squirrels were the likely culprits. Now here in Nolalu I am getting to see the pickers in action. The nuts are still in their beaked husks and squirrels are working overtime hauling them away. They are joined in the harvest by blue jays. Remember the blog about blue jays spreading oaks northward by flying away with their acorns. Well, they do the same thing with hazelnuts. I would expect chipmunks like hazelnuts as well. It is mind-boggling that a person could live his entire life here and never find a hazelnut, just because wild animals always get them first. Everyday, it seems, there is another story in the media about the health benefits from walking in the woods. It lowers your blood pressure; it relieves stress, etc. I have no way of quantifying my own experience from walking in the woods (or bush as we call it here) but I know there is nothing like it. I'm especially lucky in that we live on a large tract of forested land. Ten steps out the backdoor and I'm surrounded by trees. In addition to the therapeutic effects of woods walking, I find there are doubly more rewards when you make and maintain your own trails as I do. Every time I cut up a fallen tree or mow the weeds on my trails I get a great feeling of accomplishment. There is also just the workout that comes from chainsawing, moving log sections, cutting overhanging limbs with a brush axe and so forth. One of my trail-making goals is to make a corduroy roadbed through a couple of swampy sections that can turn me back in wet weather. I'll be sure to post it here when I do. I always do my walking with a camera in my pocket and an eye peeled for new wildflowers. I find a new one on just about every trip. There are also mushrooms, birds and animals, neat light-effects from the tree leaves and other things to photograph. Have you ever heard of walking meditation? Check it out. To me meditation is simply being totally aware of the moment. So when I'm practising walking mediation, I try to be aware of the sensation of the ground beneath my feet, the smells of the vegetation, sounds of the birds and wind -- things like that -- as well as noticing all the plant and animal life. Worries and troublesome thoughts vanish. There's just no room for them. Are these fish northern pike, muskies or hybrids? Two Bow Narrows anglers were perplexed with the fish they caught at camp this summer. In the top photo Mike Boyer holds a fish that, I believe, his wife Lonnie caught. Could it be the "clear" pattern shown by some muskies? In the lower photo Troy Bechtel holds a fish that has two distinctly different patterns, small spots on its head and sides and large chains on its tail. Before I go any further, let's note the most certain way to determine if a fish is a northern pike or a musky. Count the pores on the underside of its jaw. Northern pike have five. Musky have more than five, from six to nine. So the next time you are wondering if that unusual fish is a musky, turn it over and count the jaw pores. Muskies have several skin patterns, as do northern pike, including "clear" versions for both. So really, the pore count is critical. Troy's fish is bizarre. I've never seen a fish that had two patterns at once. We sent Troy's photo first to Red Lake Ministry of Natural Resources and Forests biologist Jenn Neilson who forwarded it to pike-musky expert John Casselman. 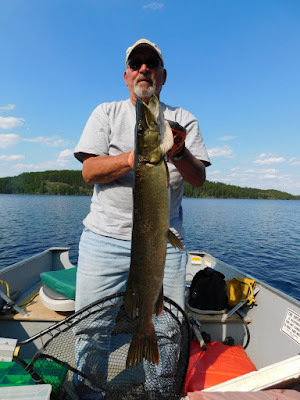 "By the colour pattern on the caudal area and on the cheek, I would say that this fish is a hybrid pike-muskellunge cross. Why the pattern appears more distinct on the caudal peduncle is a mystery to me. But in hybrids, the colour pattern can be quite strange and grotesque, so maybe this is part of the abnormal coloration response," he wrote back. I swear you could walk into the forest, close your eyes, point your camera at the ground and come up with a glorious photo that would look great framed on the wall of your home. It doesn't need to be a closeup of a flower. Just the mosaic of plants and patterns of leaves is all it takes. It is also a great way to study plants. Take a well-focused shot now and next winter when it is too cold to go outside, dig it out and see if you can identify all the plants in view. A mature white pine on our acreage. Deer eat all the seedlings. Last winter Brenda and I were honoured to be interviewed by Kelsey Jones-Casey, a researcher from Duluth who is working through Lakehead University in Thunder Bay to examine the effects of climate change on people in Northwestern Ontario. She wanted to talk to people who have spent most of their lives outdoors in Northwestern Ontario to see how climate change is affecting them. If you go to her website you can read excerpts from her interviews including ours. Most of us are saddened, anxious and even depressed by what is happening although a few see opportunities from it. There are realities, however, that temper what seem like advantages from climate change in Northwestern Ontario. For instance you might think that warmer temperatures and a longer growing season would see this area become an agricultural powerhouse. There is a bit of farming here now but it is limited primarily to hay and potatoes. One enormous reason why this region is not ever going to take over as the Breadbasket for North America is a lack of soil. Glaciers in the last Ice Age sent all of ours to the U.S. Midwest. The only soil that we have is clay, and it exists only in tiny pockets around Thunder Bay, Dryden, Rainy River and Fort Frances. Everything else is sand, gravel and peat. My observation is that there are a cascade of effects happening from climate change, most of them not obvious to casual observers. To illustrate, I'll just pick one, the emergence of whitetail deer as the primary wild herbivore. In my lifetime I have seen the disappearance of woodland caribou, the emergence and then the decline of moose and now the dominance of whitetail deer. Logging was undoubtedly the primary reason for the disappearance of caribou and the emergence of moose but climate change is behind the explosion in deer numbers. Our famous Boreal Forest winters simply don't exist any more. More important than warm temperatures, as far as deer are concerned, is the lack of snowfall. Back in the '60s there were quite a few deer in Red Lake, lured to the area by logging that produced lots of hardwood browse in cutovers. It was excellent for moose for the same reason. Then we had several consecutive winters with over four feet of snow. Deer were absolutely wiped out except for pockets at Thunder Bay, Dryden, Fort Frances and Rainy River where agriculture sustained them. Moose, on the other hand, have much longer legs and although hampered by the deep snow, are not killed by it. So deer disappeared and moose took off. Now the snow comes late, leaves early and never amounts to more than two feet. The deer have come back big-time. Red Lake is one of the few places where they still are scarce, just because it is so far from the main deer concentrations farther south, but even there the population is re-building fast. You see them especially in the town of Red Lake. And moose are disappearing. Deer carry a brain worm parasite that is harmless to them but fatal to moose. The parasite spreads quickly and easily. No sooner do you notice equal numbers of deer and moose than there are no moose at all. At our home in Nolalu, 48 kilometers southwest of Thunder Bay, moose are gone and the deer population is sky high. It has been that way for decades. Deer also bring with them ticks. When we raised our sons here in the 1980s and '90s not once did they have a tick on them. Now you can pick up several ticks just walking across the yard. Red Lake is mostly tick-free so far. The deer are also changing the vegetation. We attended a climate change conference in Thunder Bay a few years ago where it was predicted that this area will become an oak savanna due to warmer temperatures. It is currently right on the edge of the Boreal Forest. The closest oak forests are on the other side of Lake Superior in Wisconsin. Oaks spread faster than other trees, it was noted, because blue jays and animals carry away their acorns. What wasn't predicted was the rapid demise of native tree species, just from heavy browsing by deer. They eat 100 per cent of the seedlings of white pine, red pine and jackpine as well as those of white cedar and red maple. I mean, they get every one. On our 65 acres there are no trees of those species younger than 15 years old. What is left are balsam fir, black spruce and white spruce, quaking aspen, balsam poplar and white birch. Balsam fir is a prolific seeder and it is not hard to see that in the future we are going to have large stands of them throughout the Thunder Bay area. Balsam is affected about every 40 years by a pest called the spruce budworm that ends up killing them all. This leaves large acreages of standing dead trees that are among the most volatile when it comes to forest fires. At first this may seem like nothing new because the balsam-budworm-fire cycle has been going on forever. What will be different is just the sheer size of the fires. We can expect lots of towns to be threatened. And incredibly, this will have been initiated by the deer, just because they ate competing tree species for balsam. The deer are likely extirpating smaller plants too, such as wildflowers, but it isn't as obvious. So we don't have to wait for blue jays to bring oaks to the North. The forest is changing right now. And that is just the result of one new species entering the ecosystem due to climate change. Of course, there are also going to be wholesale changes just from the weather. Colossal rain events that are happening all over the world now are going to reshape the landscape in a hurry. They are also going to cause major upheavals in our transportation system. Here in Nolalu we have had two unbelievable storms in the past few years that have devastated the road network. Road crews right now are installing more and bigger culverts everywhere to hopefully reduce the problem in the future but how successful their efforts will be is unknown. As some of Kelsey's interviewees point out, weather events now are unpredictable. We can stop using terms like "100-year storm" and "500-year storm" because the new rainfalls are unprecedented. Brenda remains optimistic, as do some of the others. We will adapt, she says, and undoubtedly we will. There is no other choice. Now that we have retired after 56 years at Bow Narrows I would like to reflect a bit about fishermen over those years. I'll pose this first observation as a question: what are people looking for when they go fishing? Fish, you might think, but that turns out to be a very incomplete answer. And I'm not referring to all the other components that make a great vacation such as scenery, camaraderie, relaxation, etc. I'm just talking about fishing, the actual act of fishing. We noticed that for some people the full answer to the question above should have been something like this. "I want to catch fish but only by fishing in the manner that I like, using the tackle that I want to use and at the time of day I like to fish." Not everybody is this rigid in their approach, thank goodness, but it is astonishing how many are, perhaps one-third. I'll give two real examples, both involving a very old bait, the Junebug Spinner. 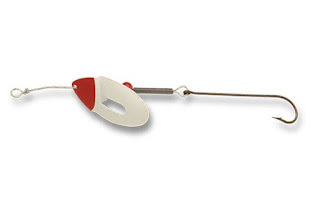 If you were to open my grandfather's tackle box back in the Great Depression you would have found this lure. It was also in my dad's. It is still sold today. Obviously, it must catch fish somewhere but it has always been an absolute dud for Red Lake. It didn't work when we first came to Red Lake in 1960 and it never got any better. Most anglers simply accepted that some lures work in some lakes but not everywhere and moved on to something else. Others just planted their feet. Since I went to school by mail, I was able to start work at a very young age. I began guiding for fishing when I was just 9 and ended up spending almost every summer day on the water from then until I was 18. I will always remember my last guest as a guide. He was alone and when I saw his fishing tackle my heart sank. He had an old, cheap baitcasting reel and a stubby solid fiberglass rod. His tackle box was the small, no-tray type and when he opened it the only things inside were a red-and-white bobber, a nine-inch pipe wrench and, you guessed it, a Junebug Spinner. I couldn't entice him to buy another lure or even accept one as a gift. Nope, he always had done well with the Junebug, he said. He insisted that we fish by trolling which I could understand because his rod and reel were incapable of casting. There was only about 12 feet of braided line on his reel and he would let about seven feet of this out at a time which meant his Junebug was about 12 inches behind the outboard's propeller. We were obviously just wasting our time fishing like this but I had to drive the guy around all week nonetheless. I decided just to head to parts unknown so at least I would learn some new water. 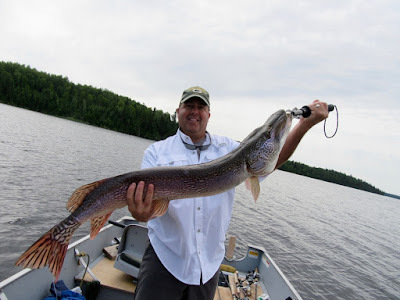 Incredibly, we actually caught two northern pike for our week on the water. Had we been trolling a Rapala or even a Dardevle at the right distance behind the boat we would have caught hundreds. The second example is more recent, probably eight years ago. We had a couple in camp in September who only wanted to fish for walleye which isn't uncommon. The fish were in about 30 feet of water at the time. Our other guests were doing quite well by anchoring and using jigs tipped with live minnows. The couple, however, was getting absolutely nothing even though I showed them exactly where and how to fish. It was their experience, they said, that if you couldn't catch walleye by trolling Junebug spinners laced with pike belly and weighted down with a one-ounce egg sinker, than there simply weren't any fish. Why are people like this? I have no idea and we eventually just accepted that some people could not be helped. They had preconceived notions that could not be blasted out of their heads. It wasn't always about lures. In fact, the most common hang-up was on the kind of location for fishing. "Just show me where there is a sandbar," more than one person told me. "That is all I need to know to catch walleyes." Unfortunately, almost none of our best walleye spots is a sandbar. Some of the contrary fishermen seemed to live just to prove me wrong on some advice I had given them. "I caught this walleye while using a steel leader, something you said couldn't be done!" they would trumpet. I would not have told them it couldn't be done because many pike fishermen using steel leaders catch a couple of walleye every day. It just isn't the best idea when you are targeting walleye which is what they were doing. Of course I didn't care if they got their jollies by believing they knew better than me, as long as they were happy. But they never were. They were always upset that they couldn't catch more fish. For these people, I came to realize, catching fish wasn't the main priority although they would insist it was. There was something else going on. I tried to express that on the blog one time in a poem. in search of yourself," I wrote. Anyone who has followed this blog will be aware of the fantastic videos posted here by the Cieplik family over the years. Here is the latest, from their trip to camp just a couple of weeks ago. Just when you think these things can't get any better, along comes one like this. Brenda has been working hard to establish some flower beds around the house. She finally got this one just to her liking. Then we went to town today to get some supplies and the trail cam tells the rest. I showed a photo earlier of a small bear eating clover in one of my clearings. He still makes an occasional appearance on the trail cam watching the spot; however, there are hundreds of photos of deer eating the same stuff every day. I had made a small clearing in the spot, just from cutting out dead trees, and hand-broadcast some white clover seed as well as a commercial deer plot mixture. The clover has grown very well. The only thing that grew from the commercial mix was one big sugar beet the first summer. White clover not only feeds bears and deer but ruffed grouse and snowshoe hares as well. Since it is perennial I only need to plant it once. In a lot of the nighttime trail camera photos I can see bats flying back and forth over the deers' heads. That's cool too. Maybe the clover attracts moths that the bats feed upon. The flying mammals often are photographed low to the ground. A couple of people have ribbed me a little about bothering to identify obscure plants and flowers. I just always want to know what something is. I realize most people aren't "into" plants, just fish and animals. So what if they met someone who wasn't "into" those things? That conversation might go like this. Hey, Al, how did you do fishing today? "OK, I guess. We got some of those prickly-backed things." Prickly-backed? What are you talking about? "I don't know their names but we just call them prickly-backs. Funny-looking things with spikes on their backs and weird eyes." Walleyes? Did their eyes look like mirrors? "We just call them prickly backs." OK. Did you catch anything else? "Yeah, some of those torpedo fish." "Yeah, they shoot through the water like a torpedo." Those are probably northern pike. "They're torpedo fish to us." "A bunch of those teeny-stripers. That's about it." Were they about as long as your hand with vertical bars on their bodies? Hmm. Did you see any animals? "A huge horny thing! It came right in the water. I said 'we better get out of here before that thing eats us!'" Did it have a big nose and were its "horns" really wide? "That's it! It looked really mean." A moose. You saw a bull moose. They are vegetarians. They don't eat people. "Then along came this insane duck. It started freaking out -- screaming and laughing -- and I said "Man, that thing looks like it wants to peck our eyes out!'" Was it black and white with red eyes and a dagger-like beak? It was just a loon. The red eyes help it see underwater. It can't even walk on land and I don't believe loons have ever harmed a human. "And we saw the cutest hairy thing. We wanted to pick it up and bring it home, it was so cute." "Kind of like a small dog, 'cept it didn't have any tail. Cute as a button." Sounds like a black bear cub. Don't pick those up. Dwarf raspberry. It is delicious! Close-up. Its scent indicates it as Plantanthera huronensis. Cork and I have been delighted by all the things we are finding on after-supper walks. We take the camera and keep our eyes peeled for the latest blossoming plant. The air is nice and cool and the light, although a bit dim, has a wonderful quality.